WP 2 aimed to speed up the process of overcoming technical and practical bottlenecks for implementing slurry acidification technologies (SATs) in the Baltic Sea Region. A feasibility study summarized the understanding of and solutions for potential issues and risks related to the transfer of SATs to countries in the region. Seminars and or workshops were organized for farmers, farmer associations, advisory services and other relevant stakeholders to disseminate WP2 outputs. Some findings summarized in poster form. In-field and in-storage technologies are the easiest to implement. In-house technology is best implemented in connection to the construction of a new animal barn. The amounts of acid required to acidify the slurries to a specific pH level varied widely between slurry types. Research about the impact of acidified slurry on soil showed that the acidified slurry induces more soluble salts into soil solution compared to non-treated slurry. Some of these compounds are more movable, which causes risk of faster leaching. The most obvious benefit of acidification is its ability to reduce ammonia emissions from slurry, both from storage and after field application when enough acid is used. 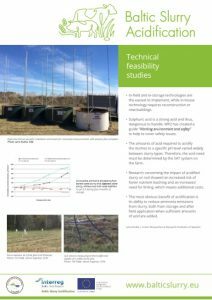 The feasibility study can be read below. Find the rest of the reports here.